He is regarded as one of the most creative thinkers in astrophysics: Professor Christof Wetterich investigates the origin of the universe and searches for explanations for the existence and effects of dark energy. The understanding of dark energy will help us to learn more about the origin and future of the universe. The Heidelberg physicist holds the Johannes Gutenberg Endowed Professorship 2014, sponsored by the "Friends of Mainz University." In his lecture series entitled "From the Big Bang to Dark Energy – Time Travel through the Universe," Professor Christof Wetterich and top international scientists will look at models of the current universe and its history extending over billions of years. "Christof Wetterich is one of the internationally leading scientists in the field of cosmology, particle, and gravitational physics," explained Peter Radermacher, chairman of the "Friends of Mainz University" Association. "With the Higgs discovery as one of the most important scientific discoveries of the past 30 years, particle physics stands at an exciting phase of further development. The findings of the coming years could shape our world view in a revolutionary way, much as the theory of relativity and quantum mechanics did in the beginning of the last century. Based on his outstanding research performance, Wetterich can define the current discussion about the expansion of the universe better than anyone else, and this perfectly justifies our award of the endowed professorship." Breathtaking astronomical observations of recent years can make a dream of humanity become true, according to the words of Professor Christof Wetterich: a description of the current universe and its history over billions of years, supported by observation. Combined with the discoveries of elementary particle physics, his view offers a consistent picture of the universe from a point in time one millionth of one millionth of a second after the Big Bang up to the present day. "In his series of lectures in the summer semester 2014, Professor Christof Wetterich will address fundamental issues such as the origin and evolution of the universe and the meaning of space and time," said Professor Andreas Cesana, chairman of the Johannes Gutenberg Endowed Professorship foundation. "And he will deal with the important questions of cosmology: What does the universe consist of? What is the nature of dark energy and dark matter? What does the future of our universe look like? How did our universe originate from the Big Bang? What roles did space and time play at the Big Bang? Is there a 'Before'? Are the natural laws of physics variable? Other topics that will be discussed, in particular with guest speakers, relate to dark matter, black holes, and the measurement of accelerated expansion through supernova explosions, as well as computer simulations of the formation of galaxies and galaxy clusters." Professor Christof Wetterich is internationally recognized for his work on dark energy, which accounts for 70 percent of the energy density in the universe. Already in 1987, more than ten years before dark energy was actually discovered in the cosmos, he described the possible existence of so-called dynamic dark energy. Here, the Heidelberg researcher examined the role of dark energy on cosmic background radiation and the structure formation in the universe as well as possible coupling between dark energy and dark matter. Wetterich is also known for developing the method of functional renormalization. This makes it possible to trace the complexity of the macroscopic world back to the "simple" physical laws of the microcosm. With the quintessence model, he delivered one of the most popular explanations for the accelerated expansion of the universe. After studying physics at the universities of Paris, Cologne, and Freiburg, Christof Wetterich received his doctorate at the University of Freiburg in 1979. The scientist, born in 1952, first worked at the University of Freiburg, before he conducted research at the European Research Center (CERN) in Geneva, at the University of Bern, and at the German Electron Synchrotron (DESY) in Hamburg. In 1992, the physicist was appointed to Heidelberg University. 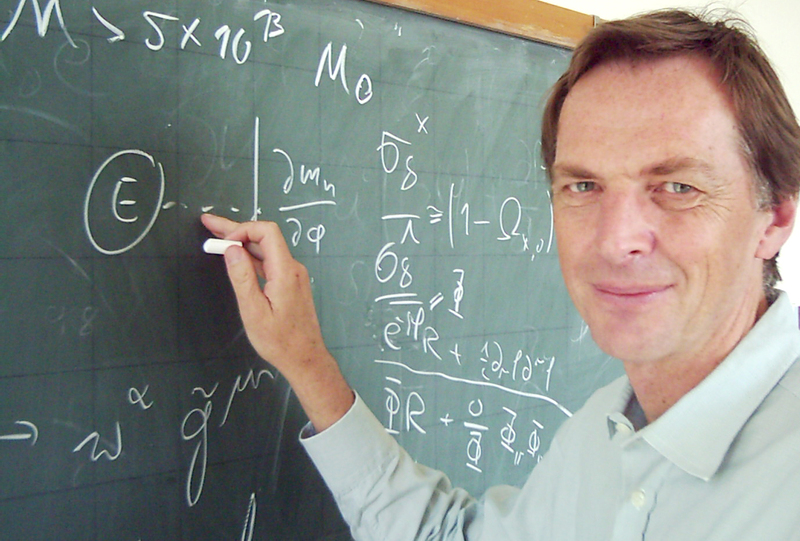 Wetterich received the Max Planck Research Award for his research on dark energy in 2005. In 2011, he received a highly-endowed five-year sponsorship from the European Research Council (ERC), an ERC Advanced Grant for top researchers in Europe. The internationally renowned physicist from Heidelberg was a member of the Scientific Council of DESY from 1996-1998 and, since 1998, has been a member of the selection committee for award winners of the Alexander von Humboldt Foundation. "How can we solve the mystery of mass? What phenomena we will encounter beyond the standard model of physics? For many years, scientists of our university stood at the forefront in particle, hadron, nuclear, and atomic physics, and devoted themselves intensively to these issues. In 2012, their outstanding achievements led in to the establishment of the Cluster of Excellence PRISMA," said the President of Johannes Gutenberg University Mainz (JGU), Professor Georg Krausch. "Mainz University has thus found an excellent contact partner for these scientific questions in Christof Wettrich and the lecture series will once again draw the attention of the public to our university and thus contribute significantly to its reputation." The "Friends of Mainz University" Association established the Johannes Gutenberg Endowed Professorship foundation on the occasion of Johannes Gutenberg’s 600th birthday in the year 2000. The following have held the endowed professorship so far: the cultural historian and recipient of the Peace Prize of the German Book Trade Fritz Stern (2000), the leading representative of evolutionary biology and pioneer of sociobiology Bert Hölldobler (2001), former German Foreign Minister Hans-Dietrich Genscher (2002), the former President of the Alexander von Humboldt Foundation Wolfgang Frühwald (2003), the former Executive Director of the United Nations Environment Program (UNEP) Klaus Töpfer (2004), the composer and conductor Peter Ruzicka (2005), the Viennese experimental physicist Anton Zeilinger (2006), the immunologist Fritz Melchers (2007), the literature and social scientist Jan Philipp Reemtsma (2008), the Bishop of Mainz, Karl Cardinal Lehmann (2009), the neuropsychologist and cognitive scientist Angela D. Friederici (2010), the art historian and scientist Gottfried Boehm (2011), the palaeoanthropologist Friedemann Schrenk (2012), and the economist Gerold Krause-Junk (2013).